So what did I do to become "Agile"? And yes, all of my assignments had nothing to do with software. In case you didn't know, agile was not invented for software developing. In 1930s a small company known as "Toyota" changed the typical way the organization used to work and started something new called "Lean" - you can read about it in this article. I adopted the agile methodology in to the world of my course. My team always worked in scrum so daily meetings, retro's, review's, backlog and user stories are always on my mind. However scrum doesn't give you the tools to deal with sudden tasks (like supporting production applications or fixing production faults). Kanban on the other hand does. In order to succeed I need them both. So like a true agile believer I was creative. 1. Plan ahead the way I deal with my projects. 2. Improve all the time in completing all kind of tasks. 3. being able to set tasks for every day and keep history of my daily progress. 4. Understand which projects I give more focus and which I "forget". 1. Daily meetings - Every day I took 5 minutes to plan my day - I wrote down on a piece of paper (introducing: "The daily paper") all the tasks I had to do today and where they belong (sudden tasks, course assignments, project task). I kept it with me all the time so I'd know what my status is. How could I know which tasks I had to do and when? Backlog! 2. Backlog - As I received my mission (the project) I divided it to features (if it was possible) - individual parts that together complete the whole mission. Every feature I divided to user stories and every user story to tasks. I set the priority of every task in order to know which to pick in my daily meeting. 3. Retro - I didn't have sprints because the course lasts only for 10 weeks, so I performed a retro every day (yes, it was with only with myself). I looked at my daily paper and checked which tasks I've completed and which I had not and why. 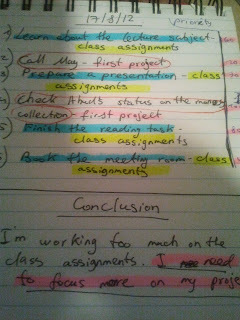 The next day I focused on improving the reason of not completing those tasks. 4. Review - whenever I completed a feature I showed it to my "customer" my teacher (he’s not really a teacher but that will do) and got the feedback, good, bad or both. Only after a fixing all the comments from the review the feature was “done”. 5. Kanboard - I wanted to get transparency. To know what I did every day, which tasks took most of my focus. The daily paper was updated during the day, marking completed tasks in green color and those that for some reason I didn't finish were parked in red. Every task was connected to it “User Story” mission or project so I could see what projects had more focus. 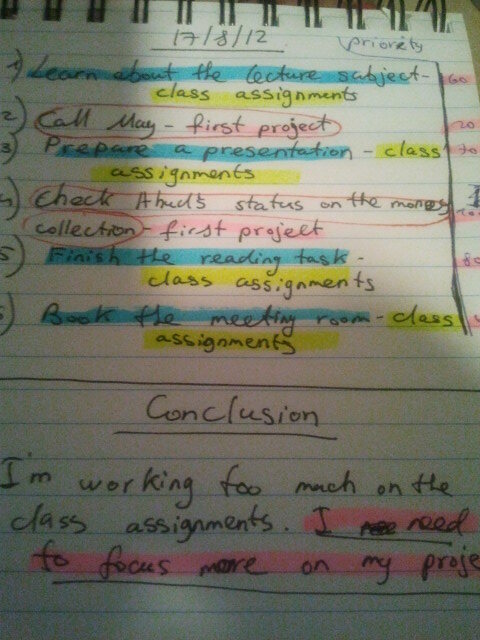 The next day I would focus on other tasks more. The daily paper was my kanboard. Using all those helped me focus on the right tasks and always improve myself. The course hasn't end yet so I can't really declare that doing those was a smart move. Don’t worry. I'll let you know.